As the weather warms up, it’s hard not to daydream about all the warm weather activities Summit County has to offer – including those green links! Golfers of all experience levels will be able to find the perfect course surrounded by panoramic mountain views. Continuously voted as one of the best mountain courses in Colorado, The Raven Golf Club at Three Peaks is both challenging and breathtakingly beautiful. Surrounded by stands of pine and aspen, mountain lakes, and snow-capped peaks, this 18-hole course is located in Silverthorne. The ever family-friendly Keystone offers two expertly designed courses. Both Golf Magazine and Golf Digest have rated Keystone as one of the Best Golf Resorts in America, surrounded by panoramic views of the Rockies. Oriented around the Snake River, the River Course offers elevation changes, water hazards, and multiple tees. Spectacular views of Lake Dillon and a 194-foot elevation drop at the 16th hole make this course a truly special experience – but watch out for wildlife! Challenging for all experience levels, Keystone Ranch follows the links-style across the front nine while the back follows a more traditional layout with slight elevation changes. 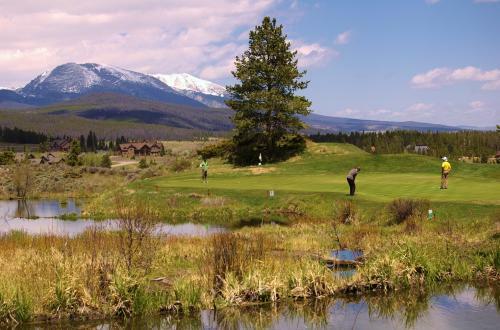 Practice your backswing at one of Breckenridge Golf Club’s three nine-hole courses; the Bear, the Beaver, and the Elk. Playing at over 9,300 feet, these expertly designed courses offer a true mountain golf experience. Surrounded by the snow-capped Rockies, native grasslands, and stands of pine and aspen, wildlife on the course is a very common occurrence. The Copper Creek Golf Course is the highest championship golf course in North America and is perfect for beginners and seasoned golfers alike. While the front nine exhibits the scenery and wildlife Colorado is known for, the back nine is a trip back in time through the remains of a 19th-century mining town. Known for ski slopes and sunshine, Summit County is also a hidden golfer’s paradise! Spend a relaxing day on the course before returning to your luxury accommodations with River Ridge Rentals. Book your golf getaway today!